If you're on a mission for a casual yet incredibly stylish getup, go for a blue leather biker jacket and beige floral skinny pants. As well as totally comfortable, both pieces look great paired together. Opt for a pair of Nine West gabelle 40th anniversary capsule collection sandal to instantly up the chic factor of any outfit. So as you can see, looking seriously stylish doesn't require that much effort. Just make a light blue cotton wrap dress your outfit choice and you'll look incredibly stylish. For shoes, choose a pair of Nine West gabelle 40th anniversary capsule collection sandal. 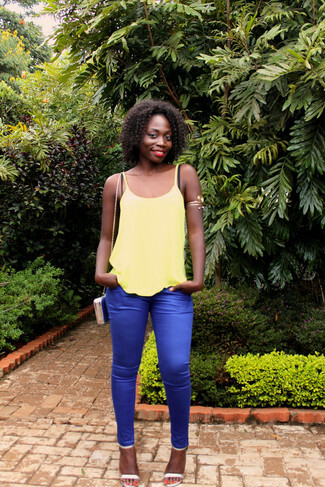 If you're on the hunt for a casual yet absolutely chic getup, team a yellow tank with blue skinny pants. As well as totally comfy, these pieces look great when worn together. Rocking a pair of Nine West Gabelle 40th Anniversary Capsule Collection Sandal from Nordstrom is an easy way to add some flair to your getup. If you're after a casual yet stylish look, try teaming a black lace sleeveless top with black dress pants. As well as totally comfy, these two garments look fabulous when worn together. You could perhaps get a little creative when it comes to footwear and lift up your outfit with silver leather heeled sandals. 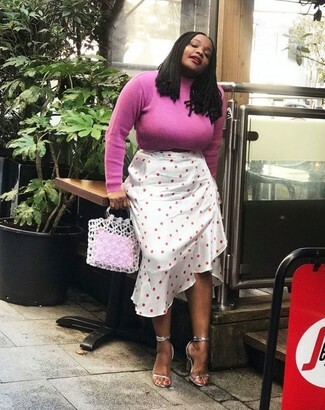 Go for a hot pink turtleneck and a white polka dot midi skirt for both chic and easy-to-wear look. Look at how well this ensemble pairs with Nine West silver leather heeled sandals. If you're hunting for a casual yet seriously chic ensemble, reach for an orange embellished cropped top and a pink pleated midi skirt. Both of these items are totally comfortable and they also look great together. Sporting a pair of Nine West silver leather heeled sandals is an easy way to add some flair to your look. Make a silver sequin sheath dress your outfit choice to be the definition of sophistication. For shoes, go for a pair of Nine West Gabelle 40th Anniversary Capsule Collection Sandal from Nordstrom. If you're hunting for a casual yet totaly chic outfit, try teaming a navy leopard blazer with black wide leg pants. As well as very comfy, both of these pieces look stunning when paired together. Nine West gabelle 40th anniversary capsule collection sandal are a good choice to complement the look. 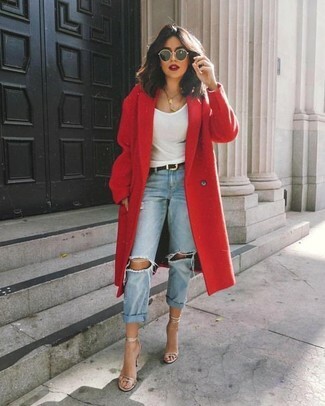 Reach for a red coat and light blue ripped boyfriend jeans to be both cool and relaxed. Dress up this ensemble with Nine West silver leather heeled sandals.